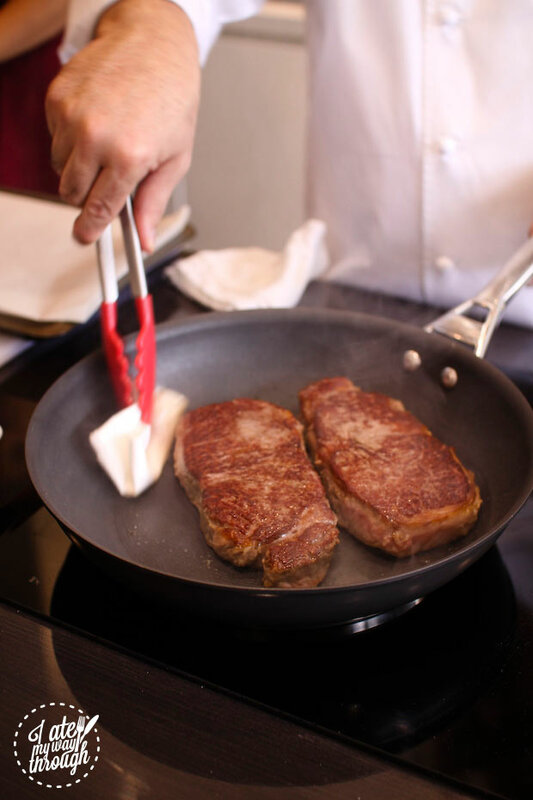 There are many myths about grilling steak correctly. Some will preach that you should only turn it once to get a good crust, and others like Heston will recommend you flip it every 15 seconds (we can satisfyingly confirm that both methods work). 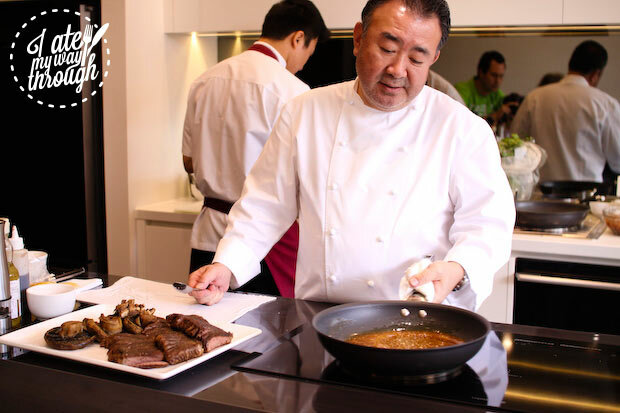 At a recent Electrolux masterclass with Tetsuya Wakuda, I learned an even more effortless method of cooking. 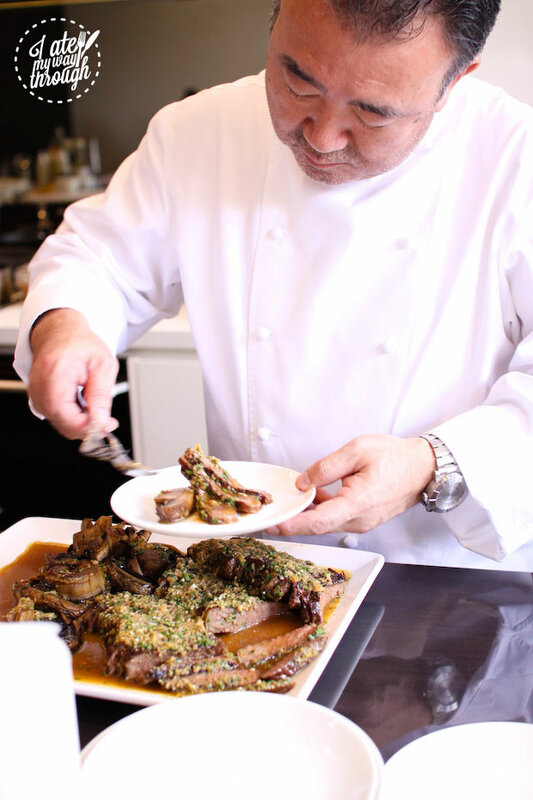 Tetsuya said this was perfect for entertaining because the steak essentially can be prepared in advance and left in the oven to slow cook. Tetsuya’s “easy way out” steak as he calls it, involves searing a good quality steak (he used Blackmore Wagyu) on an induction cook-top with white sesame oil (not to be mistaken with toasted sesame oil which is a lot stronger in flavour and primarily used for salad dressings and finishing stir-fries, etc). 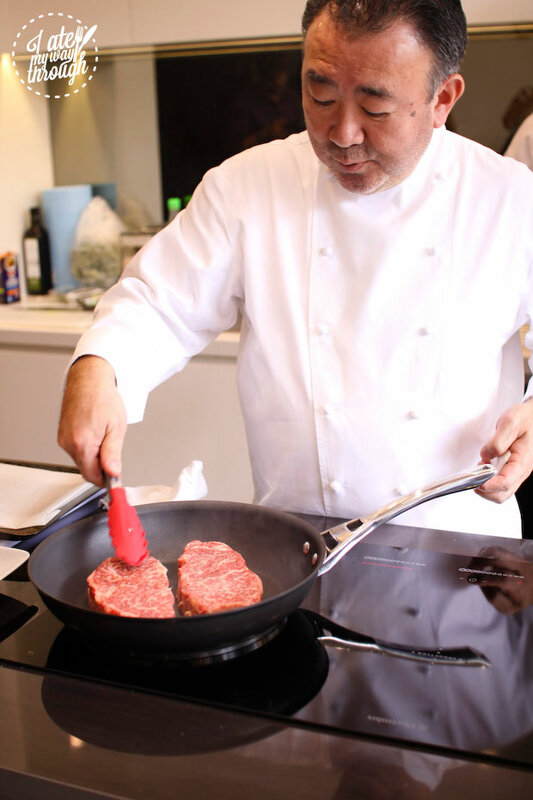 While the recipe could obviously also be cooked on a regular electric or gas cook-top, Tetsuya favours the precision and controllability of induction cooking. Paper towels were also used often, to wipe off pan juices. While I initially thought it was to remove excess moisture, Tetsuya laughed and said it was to make the pan easier to wash afterwards! The induction cooktop, he said, could also be later wiped down with just a paper towel. The steak was then placed into a preheated oven of a very low 55 degrees, to cook for up to two hours. 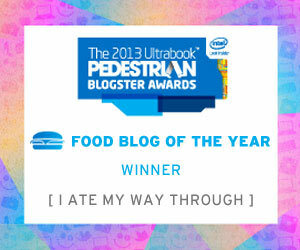 But the real magic was in the sauce. Six ingredients were all that was required. 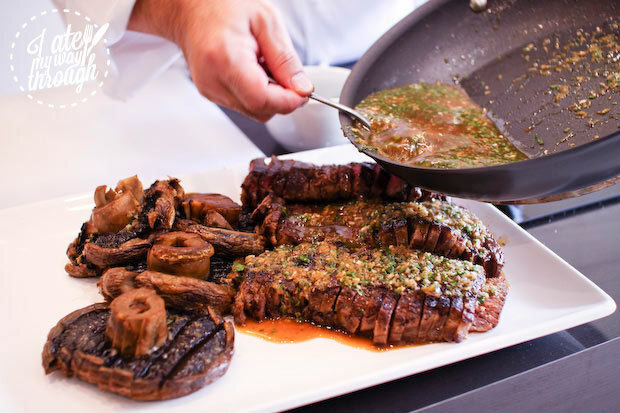 Imagine hosting a dinner party with a show-stopping main course such as this – it couldn’t be easier! 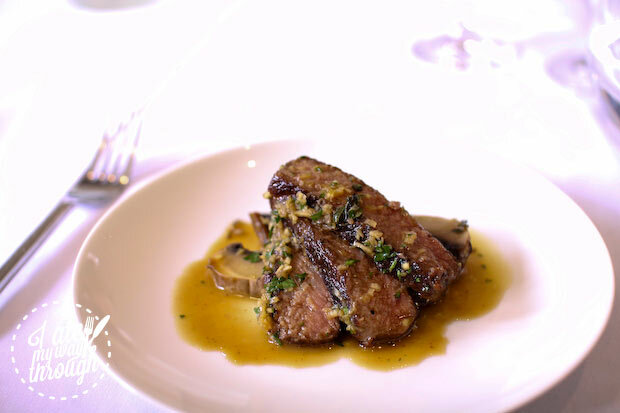 Tetsuya's soy butter sauce effortlessly turns an ordinary steak into a sumptuous fine-dining-at-home experience. Trim the fat from the sirloin. 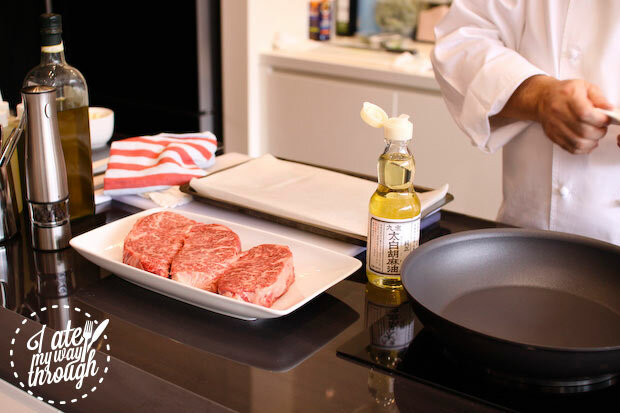 On a high heat - induction 8, place the sirloin in a pan with white sesame oil. Completely seal both sides. Take a piece of grease proof baking paper and in the same motion as wringing out a wet towel, scrunch into a tube about 5-10cm in diameter. Make 5 of these and place in rows on a baking tray. Place the sirloin pieces so they are lying over the tubes with no piece of the meat touching the metal of the tray. Place into a preheated oven of 55 degrees and leave on this heat for up to 2 hours. 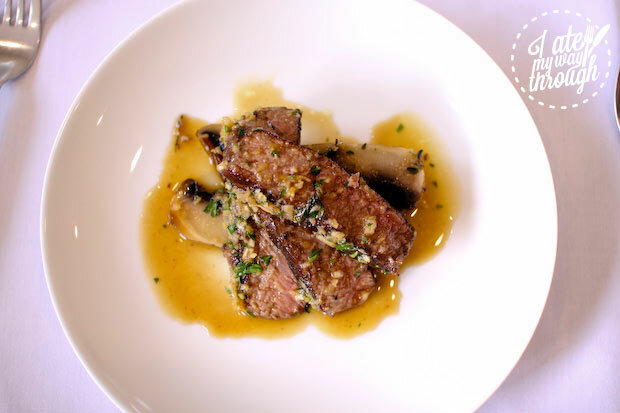 Make a soy butter sauce to go with the beef, bringing the soy and mirin to the boil. Once it boils, add the butter and remove from heat when the butter is melted. Add the eschalots and chopped ginger and garlic. 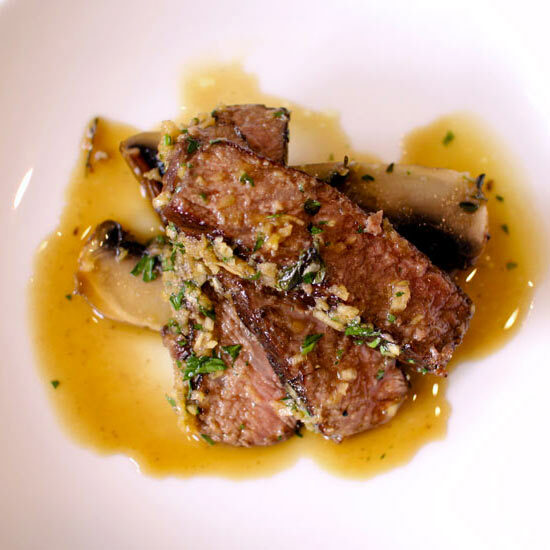 Serve beef with the Soy Butter Sauce drizzled over it. 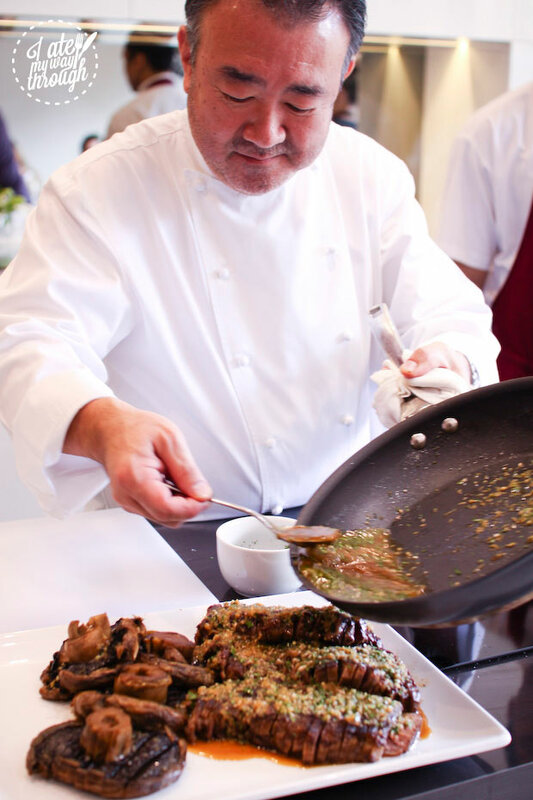 Mushrooms complement the steak and soy butter sauce very well - choose large heavy field mushrooms. Add these to the grill pan to cook alongside the steak. To prevent them from shrinking and drying up, add stock in the middle. I notice some green in the sauce is this a herb? Do you know what it is?